My little was super excited to help unpack the Ozobots when they arrived. Last year when I asked my kids what they wanted to do over the summer I was expecting some of their answers like swimming and playing at the park, but I was not expecting my son to say ‘robotics’. I was caught off guard and not sure what to do. Thankfully our local library is amazing and we signed up for Scratch programing and robotics summer classes. Then one of my friends also mentioned Ozobot to me. It took a couple posts on the web for me to realize Ozobot might be the perfect little robot for my son who was interested in robotics. I really wanted to see this cubic inch robot in action. Last year I applied to host a Tryazon back to school Ozobot party, but wasn’t picked. We hung out at the Barnes and Noble Maker event for almost two hours hoping to see Ozobot, but it wasn’t brought out for show while we were there. 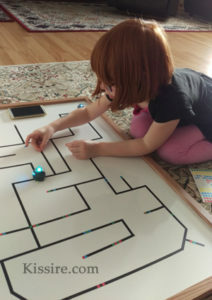 I liked the Ozobot and Tryazon Facebook pages. I talked with other friends who wondered what this little bot might be like. 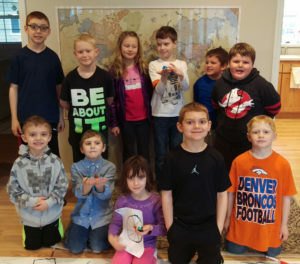 Then at the end of January, Tryazon announced an Ozobot Evo party opportunity. 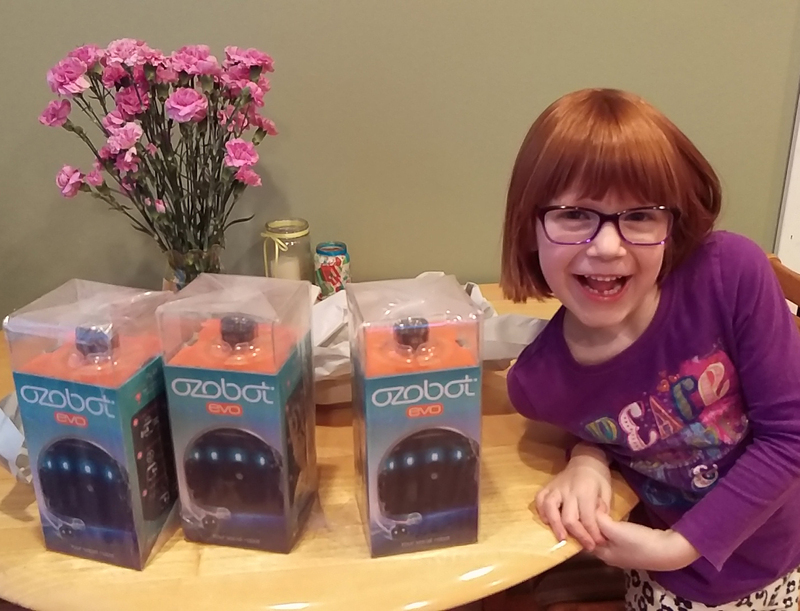 I was super excited to enter for a chance to host an Ozobot party. I marked the day party hosts were being selected on my calendar. I constantly refreshed my email account that day and might have exclaimed out loud when my email arrived saying I was chosen to host an Ozobot Evo party! Applying 1/4″ colored dot stickers to the masking tape track. I searched the web to see what other people had tried with Ozobot. 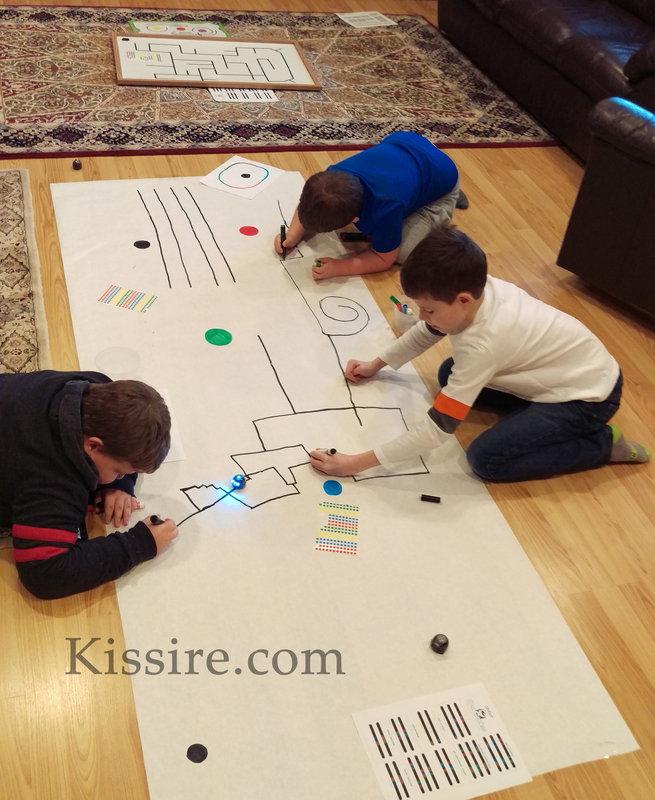 I really liked the Techagekids post about LEGO meets Ozobot. Their tape track and LEGO buildings for Ozobot were so cool! I had a 2×3′ white board in the garage that I could use for an Ozobot track. I searched on Amazon and found 1/4″ black masking tape I used to make the path. I also found 1/4″ colored dot stickers by Avery to use for Ozobot color codes. My kids stuck codes where ever they wanted to on the track layout. I taped a large chunk of white roll paper to the floor. We colored large dots to play OzoLaunch on the paper and several black dots for calibrating. I set out Ozobot markers and Crayola markers so the kids could experiment drawing their own paths for Ozobot to follow. I had extra sheets of white paper for kids who wanted to work on their own piece of paper too. The colored dot stickers came in handy for kids who had drawn their track and wanted to add codes after the fact. My kids both have old phones they are allowed to use. We loaded the Ozobot Evo app onto them so we could use the remote control feature, play OzoLaunch, and run OzoBlockly programs. I even cut out a bunch of Ozobot ‘hats’ for kids to decorate if they wanted to. Several kids were into this, but most of them were keen on all the other activities. I had a roll of raffle tickets the kids wrote their names on to be entered for a chance to win their own Ozobot. I got to give away 2 Ozobots and keep one for my kiddos! 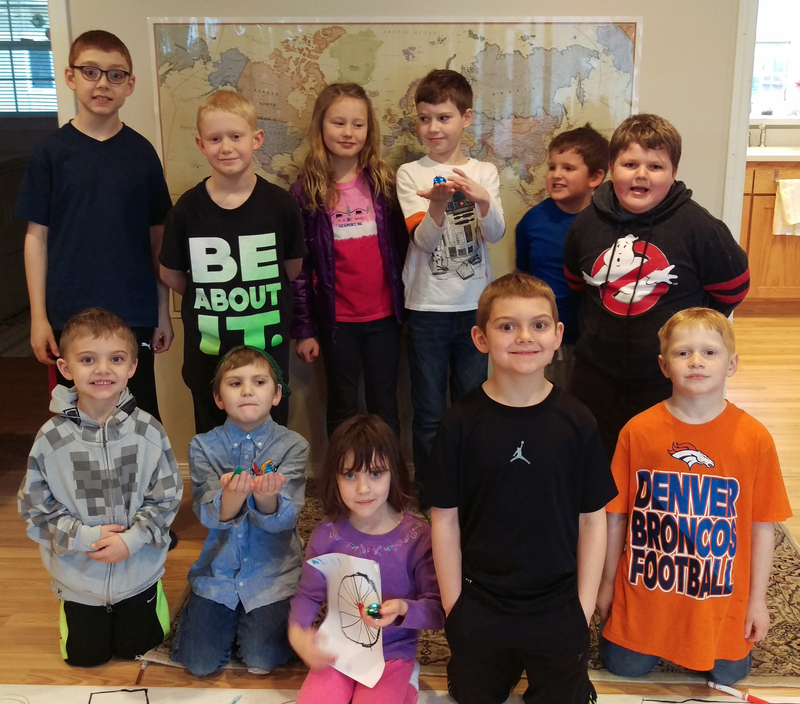 24 kids and 10 adults stopped by to meet Ozobot. This group photo captured the high point in attendance. I had so many kids and friends I wanted to invite to check out Ozobot. I ended up having an open house, drop by when you can, style party from 12:30-4:00. It worked well. We had a steady stream of kids and parents stop by. Everyone got to spend a good amount of hands on time with an Ozobot. The only down side was after the first hour and half or so the bots needed to charge! The second half of the party I had two Ozobots running while one charged and we rotated out as we could. I enjoyed getting to try the Ozobot Evo and showing it to as many people as we could. The bot’s expressive noises are cute. 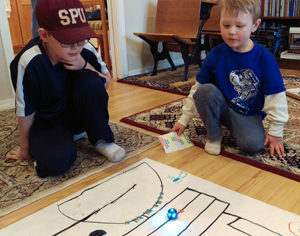 The kids enjoyed drawing their own tracks for Ozobot and watching the bot follow their designs. Sometimes the Ozobots get confused when there are several on and being remote controlled. You can end up with one device controlling all three. It took one of the kids to figure out how to get OzoBlockly to work with Evo. You have to switch the toggle in the upper left from Bit to Evo. I was so excited to get started, I didn’t read the online start up screen completely. 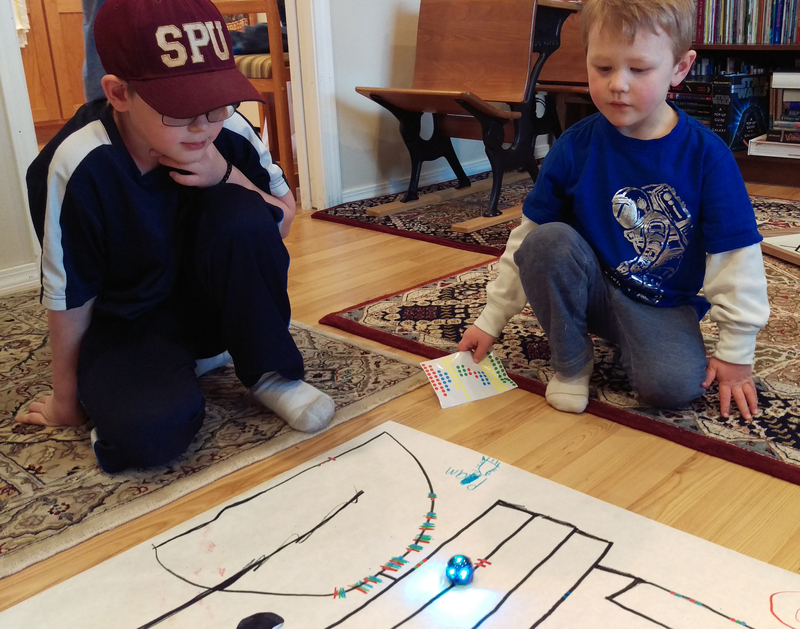 The kids enjoyed coming up with their own commands for Ozobot Evo to follow. They even liked sending “boop beep boop” messages in OzoChat. This entry was posted in webness by Amanda. Bookmark the permalink. Thanks for inviting us! It was fun to watch the little bots in action!